I have started a new project. I don't know how many interiors I will make, but I started with this one - command room. it's still very early but I like to keep track of my project from the beginning. Camera from the movie had a bit wider field of view, but that's fine. I think I got the general look just fine. Well done! Will definitely keep an eye on this project. I did both the cockpit and pod bay for the Discovery model I made. Found it a bit difficult to reconcile the two different sets with the Discovery hull, but eventually got everything to fit. The cushioning doesn't quite match on the triangular bit in the center. The three on the sloped surface aren't the same size in the reference, and the third and fourth from the left on the vertical surface should be connected into one. Other than that it's a great start. Guerrilla, yes I noticed that. The screens in front are also a bit off, HAL's eye and rectangular panel are also not right. Maybe head support should be a bit bigger. But thanks for pointing it out. Tralfaz, I understand what you mean. First thing I noticed was that the spherical part of the Discovery is smaller than what it should be. 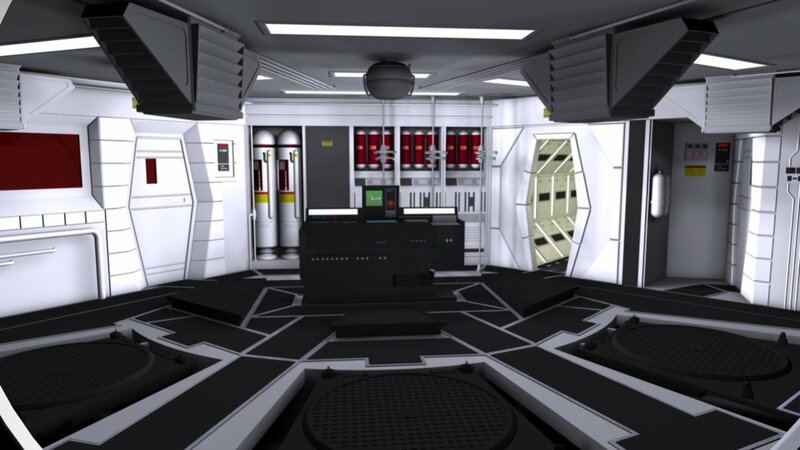 Then second thing, the white corridor from pod bay goes nowhere. And in 2010 we saw a crew member walk into that corridor from right side, but on that side the corridor is right against outer hull. Do you have renders of your model? I'd love to see how you did it. Rekkert, thanks for your comment. This is a view of the pod bay area looking through B pod doors. This was done back in 2001 (at least I think so) and looking at it now is kind of embarrassing. I thought I was pretty good back then but not really. Can see so many inaccuracies in this mesh. I am currently doing all of the 2001 ships and space scenes. I think I will be revisiting this and bringing it up to snuff. That looks really good to me. Especially when taking into consideration that it was done in 2001. Crap and thank you. I meant to say it was done in 2011. Ah, OK. If you only re did lighting it would look much much better. Awesome! That reflection in HAL's eye adds a great bit of nuance. Great progress! I love all the little reflections. Great work! Plus there's an ATM there, that's so convenient! Fantastic model japetus, I love it. Both of your work is brilliant. I know what Japetus means about fitting everything in. I just updated my Aries 1B with a basic interior and couldn't get both levels to fit. I cheated and shortened up the cockpit so things would fit. It isn't near as detailed as Japetus's. I think they had to remove part of the top side of the set. Because if you look at depth of field it looks like it was shot with long lens. And if you look at where the console is in relation to the seat it seems to me that they shot that from high above with top part of the set removed. 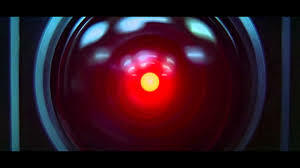 At first I thought that they filmed that through the front window, but how it looks they had to film it right above the consoles, where screens and HAL's eye would be. Red line is what camera would see at lowest point of the window. Blue line shows you the lowest part that was seen from above. The camera would be pointed right along the red line making anything between red and blue obstructed from view. They did film from the top pointing the camera down. Pool was sitting on his back in the cockpit. At the bottom of the set was a mirror placed at a 45 degree angle and Bowman was standing in front of the mirror. This all made it appear as if they are at a 90 degree angle to each other. I'm really amazed by methods that older filmmakers used before CGI. We have it really easy these days with computers. Progress is slower now mostly because there are so few photos of cockpit and for some panels it's not clear what should be on them. I'll have to take some liberty and guess what is on them. And of course, materials and textures are nowhere near finished. Amazed by the quality and accuracy of your command module. I found a render from the one I did so long ago. It is no where in the class yours is but thought I would show it to you anyway. It is going to need a lot of work to bring it up to date for the project I am working on. Thanks Tralfaz, your cockpit looks nice too. With a bit better textures and lightning it would look awesome. Screens need to have a bit more reflective front surface. Disregard the closer panel, that's the old version of it. View from below on the computer screens. I am trying to achieve the same "projected from backwards" look on the screens. And some more work on space behind the command deck. Door on the left leads to HAL's computer core. I am still not completely happy with materials, but it's slowly coming together. Man, I love looking at your updates. Beautiful work as always.